Unless your hands are the size of dinner plates you'll be better off looking at pretty much any other phone on the market. It's difficult to fully understand the reasoning behind the launch of the Huawei P8 Max smartphone - I say smartphone because with a 6.8-inch display it should really be called a tablet. 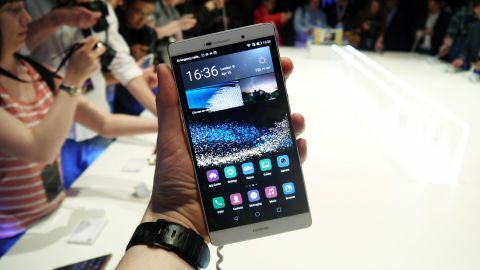 Huawei maintains that the P8 Max is still very much a phone, although it pushes the idea of a phablet to its very limits. This isn't the first supersized smartphone from the Chinese firm, the Ascend Mate and Mate 2 both had 6.1-inch screens, while the newer Mate 7 dialled things down slightly with a 6-inch offering. Perhaps there's a calling for a device this size in Asian markets, but in places such as the UK and most of Europe where the P8 Max will also be sold, demand is going to be little to none. I was told by a Huawei executive that the company is fully aware the P8 Max won't appeal to the mass market, but there is a small segment of consumers who it believes will be drawn in by this cross-over device. Priced at just €549 (around £395, $585, AU$755) for the 32GB version which is available in black or champagne, and €659 (around £465, $695, AU$890) for the 64GB model in either gold or grey, the P8 Max is actually surprisingly affordable. The mammoth 6.8-inch sports a full HD resolution, while 3GB of RAM lines up alongside Huawei's own octa-core processor to provide a decent slug of power. A 13MP camera sits on the rear, while the front facing snapper comes in at 5MP - plus there's a microSD slot which doubles as a second nanoSIM tray. Huawei has managed to squeeze all this into a frame which is just 6.8mm thick, and thanks to the handset's massive size it also boasts a 4,360mAh battery. The P8 Max borrows the same premium styling from the firm's flagship handset - the Huawei P8 - which means it does at least look and feel like a top of the range device. An aluminium unibody provides a sleek shell and the sheet of Gorilla Glass 4 on the front should offer a decent level of protection for the huge display. This isn't an easy phone to hold though. The sheer size of the P8 Max means one handed operation is pretty much out the window, and I had to employ both hands to properly use the phone. Android 5.0 Lollipop has been coated in Huawei's Emotion UI which is a little bit hit and miss and not as visually appealing as stock Android or HTC's Sense. I found performance to be perfectly acceptable, but like the P8 it didn't feel quite as fast as rival top end handsets. The software may not be final quite yet though, so things could improve. Typing on the P8 Max is impossible one handed, so you won't be able to saunter down the street with a coffee in one hand, and tap out a quick response to a friend with the other. Huawei went as far as to suggest that the P8 Max should stay in your bag (or huge pocket) when you're on the move and instead use its TalkBand B2 wearable (sold separately) to make and receive calls. Basically an admission that it's just too big. The battery life of the P8 max could be its saving grace however, with Huawei claiming 2.23 days of normal usage from a single charge. That would blow the Galaxy Note 4 out the water, while heavy users are looking at 1.4 days. Of course the trade off here is the supersized proportions of the handset and personally I'd take less battery life for a more sensibly sized device. Like the P8 the Huawei P8 Max comes with a feature packed 13MP rear facing camera, with a host of new modes and improved low-light capabilities. A quick play with the camera on the P8 Max and I found it to be relative straight forward to use and responsive - although shutter speed wasn't as snappy as I'd like. Images in the dimly lit event space looked pretty good, although you'll have to wait for our full review to see just how well it performs. Huawei has also launched a series of cases for the P8 Max, and one in particular caught my attention because it's a blatant rip-off of HTC's Dot View case. Stick it on the P8 Max can it will display core information such as the time, date and weather in a matrix style layout. It's attractive enough, but it's been done before. There's plenty of screen real estate on offer and the massive battery inside the Huawei P8 Max means you'll get a decent amount of performance from a single charge. The Huawei P8 Max will only appeal to a tiny proportion to the market, and even then it's likely to still have an uphill battle to win people over. It feels like a step too far.